November to March in East Timor is the hungry season. It is a time when more than 42 per cent of the country's one million people experience severe food shortages. East Timor is mired in poverty. On the most recent Human Development Index it ranks at 162, coming in between Benin and Cote d'Ivoire, giving it the inauspicious title of the 20th poorest country in the world. While Nauru was the base for the Howard Government's Pacific Solution, East Timor is a very different proposition. In Nauru the vast majority of people have plenty of food to eat, and get access to an education and health services. This is not the case in East Timor. Prime Minister Gillard's plan to build an asylum seeker processing centre there needs to be understood in this context. A regional approach to managing the complex issues associated with asylum seekers is long overdue, and Australia can't manage the problem alone. Yet as one of the largest and most affluent players in this region it is crucial we play a proactive and generous role. Many East Timorese seem at best hesitant about the proposal. Yet, even if we can convince the Timorese Government and its people to house the centre, the logistics of developing such a facility are manifold. The immigration laws in East Timor are at present particularly weak. Currently an 'irregular entrant', in the new Gillard-speak, has just 72 hours to lodge their application and have the matter dealt with by the Minister. If the claim is rejected, the applicant has a further eight days to get the matter heard in a court. If this does not occur, the fate of the applicant is unclear. Reports suggest some asylum seekers are living in East Timor without recourse seemingly interminably. Yet President Jose Ramos-Horta says he wouldn't want Timor-Leste to become an island prison for asylum seekers and such people 'will have to have certain freedoms'. This is not the kind of language we are used to hearing from Australian leaders. In Australia there have been many allegations of abuse by privately contracted detention centre staff. While few of these allegations have made it to court, the Cornelia Rau and Vivian Solon affairs illustrate how wrong this process can go even here in Australia. In East Timor where the infrastructure and oversight is far less developed, enormous assistance would need to be deployed to avert these kinds of disasters. Further it is unclear who will administer the system. Will it be the Government of East Timor, already struggling to meet the needs of its own people? Will the processing centres detain the asylum applicants or will the applicants be free to access the rest of the community? Who will take responsibility for unsuccessful applicants and be responsible for repatriation. It is unlikely the East Timor Government would want this indefinite responsibility. We know well of the many social problems that exist in East Timor that exploded in terrible violence in 2006. How will the integration of asylum seekers in this already fragile society be managed? There is also a tide of resentment against Australia among elements of the East Timorese population, including tensions over the gas fields in the Timor Sea. It would be easy for a people struggling to feed, clothe and educate themselves to harbour resentment against outsiders that have all these things and much more. Gillard herself said 'people like my own parents who have worked hard all their lives can't abide the idea that others might get an inside track to special privileges'. Managing similar perceptions in East Timor will be an enormous challenge — and perhaps an unfair one to be saddling our struggling neighbours with. The new Prime Minister has sought to distance herself from the policy of the Rudd Government, that some suggest was of her own authoring. It is clear we do need more creative and humane solutions. It is clear too that we need to stop the rhetoric and work with our neighbours across the region to deliver sustainable solutions. If an East Timor processing centre is to be part of that solution, much work will need to be done to ensure it meets the criteria of sustainability. And much more will have to be done to support the East Timorese people to gain access to a more equitable way of life. Jack de Groot is the CEO of Caritas Australia, which is involved in delivering aid and development globally including a long history of working with grassroots community development in East Timor. Jack, Thank you for your article. I agree with most of what your are saying, however, I think the situation in Nauru is a lot worse than described. On my visits to Nauru when the Pacific Solution was operational I met with numerous nauruans who were catching fish to feed their families and i have offered to support to programs that enable children to have breakfast before they go to school. Jobs are mostly in the public service and the wage was (I'm not sure if it has changed) $70 per week for everyone, even though the price of food is even higher than in Australia. Health care in nauru is basic and I am still in contact with Nauruans in desperate need of health care they cannot receive in Nauru. Resentment was obvious towards refugees who were eating better than many Nauruans and towards Australians working in the country. There are many similarities with the potential problems you see in East Timor if they were to host camps. I recently mentioned some of the problems in this article http://www.onlineopinion.com.au/view.asp?article=10504 and in a book on the Pacific Solution coming out next month. There are enormous potential problems to be considered when setting up missions of this kind in impoverished countries. Without any detail it is hard to make any comment on the current proposals. Great article Jack. the implications of this thought bubble from Gillard have clearly not been well thought through. It will be very interesting to see how the new PM approaches foreign policy of which she has no experience and seemingly little regard. You are spot on Susan too. many nauruans disliked the australian detention centre and the treatment they got. the situation in Nauru though is far better than it is in East Timor - and the scale of the population, 11000+ in Nauru versus 1.1 million in East Timor - and the scale of poverty is markedly different. It's completely absurd and opens the door for the 3.6 million refugees trapped in Thailand to hop across the pond and wait for us. Why on earth we can't just stop whining and do what we told the world we would when only 0.5% or less of the world's asylum seekers get here is beyond me. For a start we could stop locking people up. It is as stupid as locking up people because they applied for a drivers licence or the dole. Susan if you come back to this page, when is the book released, who by and what is it called. Susan Metcalfe, as always, is a hands on person and brings us on the ground information. When I commented on Tony Kevin's article on July 5 warning against repeats of SIEV X incidents I expressed my concern that the PM's asylum policy would be coloured by the proximity of a federal election. Alas, my concern has been realised. Beginning a conversation with regional partners (?) is spin for "putting of a decision on concrete action until after the election". It is a shameful dereliction of the duty of national leadership. It is as obvious as day is to night on the equator that there is no way we are able to stop to boats from entering our waters.Deterrent in their home lands or intermediate transit points is equally impossible as those countries hve no regard for Australia or the queue jumpers. Army camps which are considered quite suitable for our brave young soldiers who are prepared to sacrifice their lives for these people in their home countries are considered places of Boer War style incarceration by the complainants as well as the people who are attempting to queue jump. Let's have our Australian protestors open up their homes and the Jesuits open up their vast properties in Sydney and Melbourne before casting aspersions on the governments and citizens of Australia. If you were at all engaged with the issue you would realise that many, many of us are involved in assisting refugees here in Australia and in the countries from which they are fleeing. Caritas, Jesuit refugee services, mercy refugee services, the columbans in fact so many catholic and religious communities of all faiths are heavily involved in dealing with these myriad issues at every level. By the way - yes we wouldn't abide people pushing into the queues in our supermarkets or in the RTA but we are happy to let plenty of people push in to gain privileged access to our hospital system, our access to politicians, into the housing market - just because these folk have a bit of extra cash to splash around. Ahh Australia - the land of the fair go! Gillard's proposed asylum seeker processing centre in TL is her clutching at political straws and her willingness to sacrifice principles of humanity for her ambition to be re-elected in elections most likely next month. Shamefully, the asylum seeker issue in Australia was a political, NOT humanitarian, issue during Howard's elections and here we go again. Instead of setting a tone of fairness to reeducate the Australian people on the matter, politicians seeking election have succumbed to and stirred up the racist fears of an ignorant Australian majority. What I find stupidly arrogant is the deception inherent in - Julia Gillard said 'people like my own parents who have worked hard all their lives can't abide the idea that others might get an inside track to special privileges'.- her parents did not flee persecution in Wales. Whereas asylum seekers fear persecution in their war torn and shattered countries. What is morally repugnant is that most asylum seekers come from Iraq and Afghanistan- both devastating illegal wars and occupations in which Australia participates. The Timor solution for Gillard means that she will be doing exactly the same thing as Howard in Nauru by another name- Timor Leste. 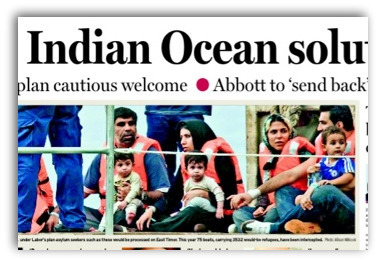 Both Gillard and Howard sideline Australia's legal responsibility to asylum seekers under international law. Besides given the long history of both Labor and Liberal governments' rejection of Timorese refugees to appease Indonesia, it would be bizarre for Timor to now assist Australia's abrogation of its humanity and legal responsibilities. It's all totally disgusting and perpetuates Australia's shame. I hope Timor has the moral dignity to reject collusion in Australia's racism. How desperate does a parent have to be to submit themselves and their children to a trip in a leaky boat, on the high seas? i myself would have been very hesitant. We need to develop our imaginations before we condemn these asylum seekers. with such courage they may become our most helpful citizens. A tiny number of asylum seekers arrives each week; people who are so desperate that they will risk their lives in a leaky boat, just as the Vietnamese did in the 1970's. We called the Vietnamese asylum seekers heroes, and welcomed them with open arms. So what is the problem now? As a Christian, I cannot vote for the conservatives,so Gillard will still get my vote, for but she has been a huge disappointment, both morally and politically. Am I being racist or politically incorrect in asking if Australia really needs another redheaded politician who surfs towards an election on a tide of anti-boat people sentiment? I am a woman but the likes of Julia Gillard does nothing for me. She is behaving like a true doberwoman fawning over the powerful and putting down the weak. So much for social inclusion. I don't get the hospital bit Max. Australians are entitled to free hospitalization. If some are prepared to pay for private hospitalization, it is provided in private hospitals and not preferential treatment in public hospitals. Ah yes, some religious organizations provide services for charitable reasons first and foremost. I don't know about one other which takes $20,000 per student a year in fees. Peter Downie writes that we received the Vietnamese refugees with open arms and called them heroes. They were welcomed by a Coalition government in 1970s because they were anti-communist. Most of them were either Christian as result of French colonialism or Buddhist. The ALP having made a mess of its opportunity to govern Australia (1972-75),particularly in foreign affairs, was in no moral position to object to the refugees fleeing a vengeful Viet Cong government, whose cause people like the late Jim Cairns, even as Deputy PM, had defended. Thirty years later the refugees are fleeing not communist regimes, but regimes under threat from within and without by Muslim terrorists. Muslim terrorism cannot be painted as united a threat as communism was. But in the battle for the minds of an insecure Australian population (especially in an election year) every Muslim refugee, man, woman or child, will be presented as a security risk. They cannot show themselves to be anti-terrorists, like the Vietnamese in 1970s could present as anti-communists. Your article on East Timor is very interesting and, like most things that you give us it is well written. Not if the money is right!! You watch. They'll take it. It is close to Indonesia [used to be part of it till about 1998], is off the west coast of Australia, the nation is impoverished and looking for an income. East Timor will get an income, they'll get work, they'll get patrol boats and kudos and support from Australia. What a patronising lot we are in this country. Why would East Timor not be an acceptable place to settle people seeking another country to live in. If the money is right, and East Timor says yes, who are we to say that East Timor is a lesser country than this. I don't pay big money to politicians to have them run this country for the likes of the UNHCR. Nor to get the approbation of any other entity. Julia, if the money is right for East Timor, go for it.Give the refugees another start in life. But it does not necessarily mean that it has to be here because a refugee has selected Australia in his/her mind instead of say China or Vanuatu. Many people are conflicted over the asylum-seeking issue. The problem is partly, I believe, trying to imagine a solution that doesn't impinge on one's own circumstances. To the extent this reflects our innate need for safety perhaps we ought not be so morally judgmental. But when I think of the events, relationships and encounters in my own life where I have failed to show unconditional love, I am ashamed and remorseful. We are so enchained by property and future-worry. The political disintegration of social safety nets has exacerbated this enchainment and fostered stress, self-interest and discouraged altruism. This is why I support socialism. Virtue seems a luxury of the satisfied and impregnable: the weak and vulnerable can fend for themselves. I think the solution to the asylum seekers issue is to make the bold but simple step of acknowledging this country doesn't "belong" to "us", that it's a blessing or privilege to have had the happy accident of being born or accepted into it, and cease this offshore charade. Perhaps accepting all boats onshore - without spurious "queue" quotas - will help our politicians finally spend money on alternative, better food production and infrastructure (including for the benefit of our indigenous citizens and other poor) and resolve our conscience dilemmas at the same time. To put this issue in context, Australia since white settlement has always had a phobia about the hordes from the north invading us! Sadly neither of the major political parties has a moral leg to stand on over this issue. I agree with Jack's comments wholeheartedly. I also have to ask why haven't we been able to help East Timor to develop? Seems the "businesses" working there are there to make a quick buck? To impose or even encourage such a scheme in East Timor is selfish and ignorant. Having messed up by encouraging smugglers again we need to fix that and Nauru may still be the best answer. What we then should do is set up a well-equipped (school, counsellors, basic trade training, simple housing) centre near some large rural town or city and focus on bringing to Australia in an orderly and ongoing manner people who have been rotting in refugee camps for years and providing 3 to 6 months of intensive English and other training to help them join us and obtain citizenship in due time. I write from Dili where I thought the days of having to apologise for the crassness of Australian political leaders in their presumptuousness towards the Timorese were past. Time to learn the lesson of respectful engagement and listening all over again. Kevin Rudd was right not to raise such an ill-conceived idea with President Ramos Horta on his recent state visit to Australia. Julia Gillard insists that the centre in East Timor centre would be properly 'run, auspiced and structured'. For the Australian Government to ensure that such a centre respects the human dignity of asylum seekers will be difficult. Similar arrangements with Indonesia were not satisfactory.